Jon Ferrara is the CEO and founder of Nimble. Ferrara is also known as the co-founder of GoldMine CRM Software Corp, and one of the early pioneers in the Sales Force Automation (SFA) and Customer Relationship Management (CRM) software industries for small-to-medium sized businesses (SMBs). 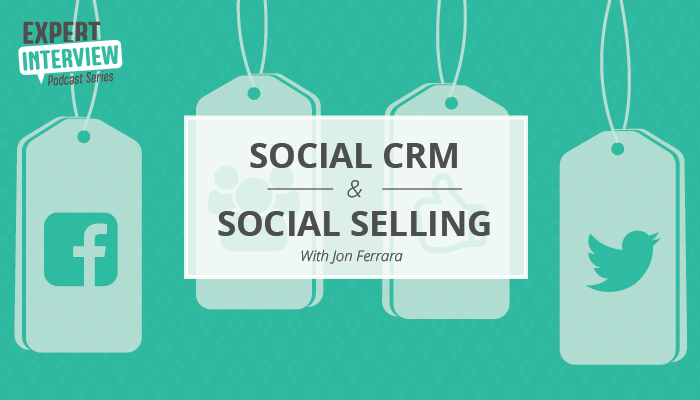 I invited Jon Ferrara on the show to discuss the #SocialSelling approach to networking, evolution and trends in Social CRM, and depersonalization due to automation and technology. We also covered the questions business executives should ask when buying new CRM software to ensure proper engagement with the customer. TECHNOLOGYADVICE: “People don’t buy great products, people buy a better version of themselves.” What does that mean and why is that philosophy a cornerstone of everything that you teach and believe in at Nimble? JON: I truly believe that we are on this planet to serve other human beings. The more people you can help grow, the more you’ll grow. And ultimately, I think we’re on this planet to grow our souls and let other people grow theirs. And we do that by being present with other people, by listening to their passion, their plan, their purpose— and then helping them achieve that. Through that sharing, through that connection, magic occurs. And that’s all we live this planet with, we don’t live it with the money, we don’t live it with our Facebook connections, our LinkedIn connections. We live it with people that we’ve served. So I truly believe when you’re out there as a business person, don’t talk about yourself, don’t talk about your products. Talk about how you can help people make better decisions faster. How you can help them grow. Because I truly believe people don’t buy great products, they buy a better version of themselves. What you want to do is figure out how you can help people achieve their passion, plan, and purpose. TA: Will there ever be a time when technology has automated so many process that a salesperson is no longer needed? JON: No. I believe that connecting with people and that the world is powered by people. The more digital we get, the more human we need to be. The modern social business has to be listening and engaging with the social customer in their buyer journey because it’s not funnel. It’s more of a pretzel. It’s a circle. It’s a dance. You need to be able to walk in your digital footprint with your prospects and customers and do what I call as the 5 E’s of social business: educate, enchant, engage, embrace, and empower your customers. So if you look at my tweets, I’d say that 70 percent is teaching and about 10 percent is what’s going on with Nimble and another 10 percent is just my human being. Just me sharing who I am. I think that you need to expose a little bit of your heart and soul, so people see who you are and their connection with you is a little deeper beyond just the business stuff. TA: When someone implements social CRM software into their workflow, what are a few basic ways they can ensure they’re listening and engaging in the appropriate ways? JON: If you’re going to use CRM, you should have a purpose behind why you’re buying it. Are you buying to get reports on what your sales reps are doing? What the forecast is? What the result of activities to results in deals? What your marketing leads are doing? Or you’re trying to buy a tool that helps the rep and your team members more effectively connect with your customers or culmination thereof? Ultimately, I think it’s a combination of traditional reporting and pipeline stuff which I think we all need the plumbing. But I think the human aspect is so critically important because without that, the adoption doesn’t occur. I think the biggest problem with CRM systems is you have to go to them to use them. Nobody wants to go to the CRM because we’re all working. We’re all in our inbox, on the phone, and doing all the things we need to do to turn these connections into mutually beneficial business outcomes with your customers. The thing I want to remind people it’s not just prospects and customers that you need to connect to as a business. That’s the biggest problem with CRM is bad data. Bad use, bad data, lack of use. So if you could have the system automatically map who Clark is, where he’s from, where he lives, what he is influential in, when you last contacted him, and what the history of all the interactions with you and your team— that gives you the starting point to be able to then engage effectively and intelligently. It’s the basics that wins the game. 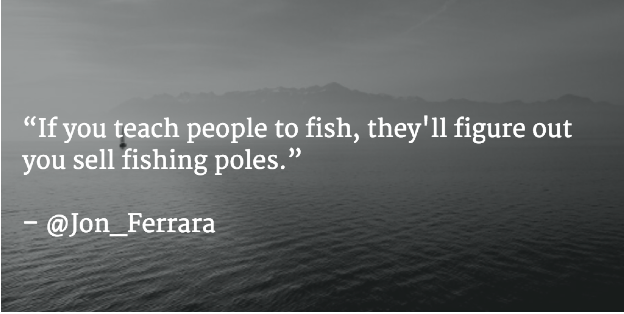 You can follow Jon Ferrara on Twitter @jon_ferrara or https://www.linkedin.com/in/jonvferrara on LinkedIn. Listen to the entire show above in order to hear our full conversation, or download the show to listen later. You can subscribe to the TA Expert Interview Series via Soundcloud, in order to get alerts about new episodes. You can also subscribe to just the CRM category here.